Theatre can only happen when a community comes together and extends a helping hand. Your support goes beyond the stage and maintains the building blocks on which the foundation of theatre is built: government support, corporate support, ticket sales and donors. Your kindness fuels and reinforces our desire to tell new and exciting stories while opening more doors and making the arts more accessible. Please consider contributing to Neptune Theatre. In giving to Neptune, you are supporting vibrant arts and education centre. It is through your generous support that we evolve and thrive. See Donor Benefits chart below. If you would like your donation to remain anonymous, please let us know. Since the Neptune Endowment Fund was launched in 2012, nearly 100 individual donors have invested in a brighter future for Neptune. Each of these donations has been matched at an almost dollar for dollar level by the federal government! As a result, the fund has grown to an astounding $2.3 million in just four years! The Neptune Endowment Fund helps the theatre keep pace with the rising cost of producing and presenting professional theatre and maintaining a leading cultural institution for the community. It also helps us develop the performers and audiences of tomorrow, through the Neptune Theatre School and our Annual Young Company School Tour. All donations to this important initiative stay in the fund forever, while Neptune benefits from the interest earned on the fund. The bigger the endowment grows, the more interest revenue we receive! This new source of income is important to our survival. You can help by giving a one-time gift, making a multi-year pledge, donating public securities, or leaving us a bequest through your estate planning. Donate to the endowment online by clicking here, or download an Endowment Pledge Sheet here. To enjoy the tax benefits of giving a gift of public securities, download our Public Securities Transfer Form. As a Neptune Endowment Fund Donor, you will be acknowledged for your pivotal role in helping to sustain and shape the future of Neptune. 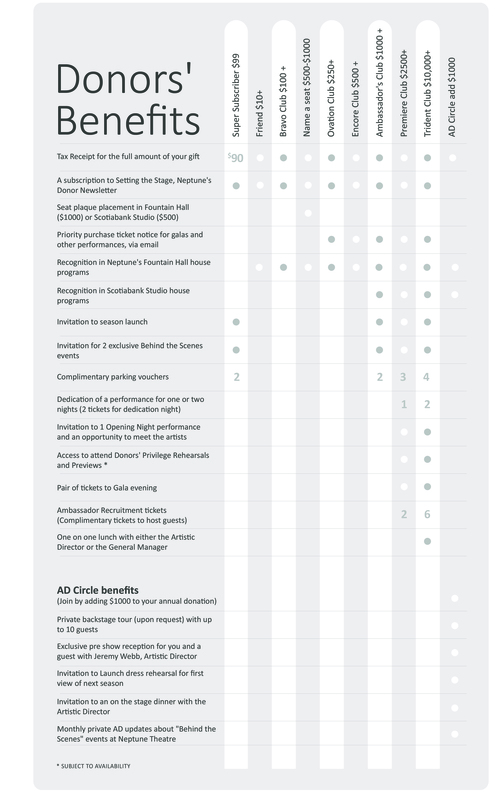 See Donor Benefits chart below for recognition levels. Have a plaque engraved with the name of a loved one on a seat in Founation Hall or the Scotiabank Stage. W hat a wonderful opportunity to honour or remember a dear friend or family member who shares your love for the performing arts. Leave a lasting legacy at Neptune Theatre and help us ensure a strong future. Consulting your family and financial advisor is always recommended, as there are many Planned Giving options. Advancing the talents and aspirations of young, emerging and established artists through the creative development programs such as The Chrysallis Project, which provides training, mentorship and employment. Providing opportunities for all members of our community to become more deeply involved in the creative process through imaginative and original programming, created to strengthen the bond between patrons and artists. Julie Martell Fund - The fund gives emerging Cape Breton performers, aged 15-22 years old, the opportunity to apply for financial assistance to participate in arts activities either on or off the island. Matt Amyotte Fund - A talented actor and musician, Matthew Amyotte was a beloved part of Neptune's family, most notably as Musical Director for the Youth Performance Company (YPCo), and as a performer in both Fountain Hall and Scotiabank Stage productions. In honour of his memory, each year, a student will receive a full scholarship to the YPCo program. Terry Erwin Fund - This fund has helped provide Neptune with a technically-advanced music room for our musicians to perform in. This room has helped improve working conditions for performers and has allowed Neptune to better the sound quality our audiences enjoy on the Fountain Hall Mainstage. Chrysalis Project - This program offers practical, hands-on experience, where emerging artists can not only work and create within the Neptune family but also alongside the broader theatre community. Wes Daniels Fund - This award honours the artistic spirit of late props builder Wes Daniels, a long-time employee of Neptune Theatre and a gifted artist. The annual award will provide a matching gift to a theatre company to subsidize, for a given production, the hire of a young professional who’s demonstrated a strong artistic sensibility in the field of theatre design. For additional information on donating to Neptune Theatre, please contact Leslie MacDonald, Director of Development and Partnerships at lmacdonald@neptunetheatre.com.